I woke up Saturday morning and had one thought in my mind- Doughnuts!! Seriously I think I must have been dreaming about them because my craving was beyond ridiculous. I was going to try and ignore the craving but then I heard the news that my Grandmother passed away. I was feeling pretty down and decided that a good long walk and a sugary treat was maybe just what I needed. So I took a long walk from my apartment all the way down to Doughnut Plant in the Lower East Side. It was a beautiful day outside and with the sun on my back and crisp air in my face I felt about a hundred times better. It’s amazing what a good walk can do for your soul! Anyway I got to Doughnut Plant and the line was out the door. Luckily they move pretty quick here and it only took about 20 minutes for me to reach the front. I had one doughnut in mind to order but the same thing ended up happening to me that always happens to me at Doughnut Plant…I go Doughnut Insane. The next thing I know I’m ordering everything and suddenly I’m outside with $20 worth of doughnuts in my bag. At least I left the store! Last time I sat down at the table and sampled my six doughnuts with the line of people just staring at me as I ate. 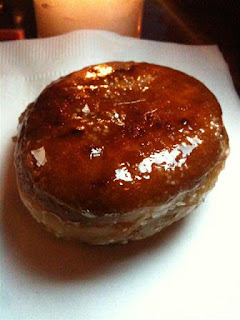 Here is the doughnut that filled my dreams and launched this whole trek The Crème Brulee Doughnut. Smaller than the other doughnuts this little nugget is one of the tastiest, sweetest things I have ever had the luxury of eating. The outside glaze is almost like liquid candy. The first bite in I was already on cloud nine. The you hit the center jackpot- custard. Luscious, creamy, wonderful custard. Like a Boston Crème Doughnut but oh so much better. I used to think the Tres Leches doughnut was my favorite but it doesn’t stand a chance against this little guy. So I ended up ordering four of those, of course two Tres Leches and then I decided to try a couple of their seasonal offerings the Carrot Cake Doughnut. This is certainly on of the prettiest doughnuts I have ever eaten that’s for sure. The first bite was good- lots of nutmeg, ginger, and overall carrotness. However something was missing. I told Mr. T what this doughnut really needs is some cream cheese filling. 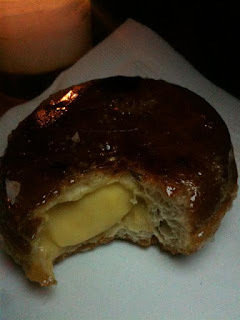 Hours later when I dove back into the bag of treats I went back to this doughnut and much to my surprise- Cream Cheese! Apparently it was all on one side of the doughnut. I just happened to miss it on the first go around. This truly made the doughnut. 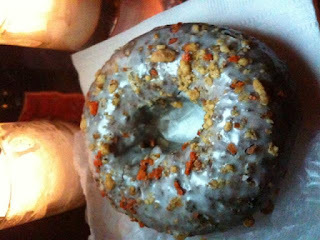 It was a perfect example of Doughnut Plant doing what they do best. A great seasonal item. Unfortunately I ended up eating way too many of these guys and had somewhat of a sugar overload but hey that happens sometime. I woke up the next morning and Mr. T and I had a lovely breakfast at Veselka of Borscht and perogies, just like my Grandma used to make. It amazing how much food touches your life without even realizing it. It was my little tribute to her in some ways I guess. Your writing hits the sweet spot and the photos make me feel like I'm right there. I could almost taste that doughnut and feel the warmth and sweet yeasty doughnut fragrance while waiting in line. I love your blog. So much, that I sampled it and linked back. Thanks so much for the link Skybridge! Hopefully I can lead you to some good eats :) That's one of my favorite Lewis Carroll quotes on your blog btw. A sad but lovely post. The Doughnut Plant is a wonderful place, although I personally still prefer the Tres Leches to the Creme Brulee! I find it hard not to order lots also, and a peanut-butter glazed jelly doughnut often sneaks in.